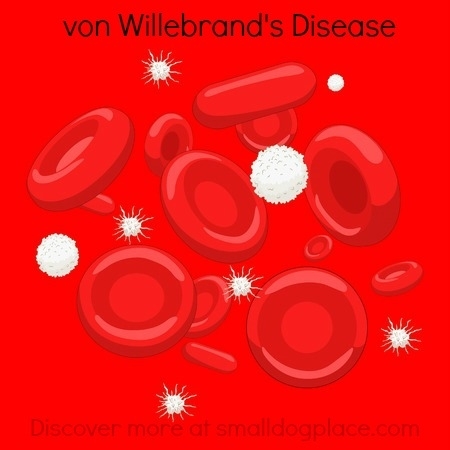 von Willebrand's disease is one of several blood clotting diseases that are found in many different dog breeds. It affects both males and female dogs, alike. A traumatic event occurs such as a dog fight or car accident, or the dog goes into surgery. What is Happening With This Disease? For blood to clot properly after the skin has been punctured, dogs must possess enough of a protein called von Willebrand factor or factor VIII, in their blood. The disease is caused by a genetic mutation that is passed on to the next generation by either the mother or father. The actual method of inheritance varies depending on type I, II, III. Three types have been identified Type I, Type II, and Type III. Most breeds are prone to Type I. Type I means that the dog has a lower than average amount of the vonWillebrand's factor. Their bleeding tendencies are mild to moderate. This is the most common form of the disease. The path of inheritence is an autosomal trait with incomplete dominance. What this means is that if either mom or dad carries the gene, any dogs within the litter of puppies will be affected but not to the same extent. The severity of the disease in the new puppy depends upon the degree to which the genetic mutations are expressed. Type II means there are very low levels and is accompanied by moderate to severe symptoms. Type III occurs when there are virtually no levels of the factor, and this can be serious and life-threatening. 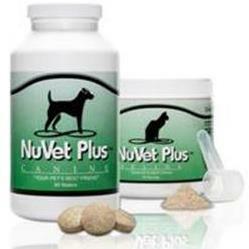 This form has been identified in Scottish Terriers and Shetland Sheep Dogs. Both Type II and III are relatively rare in dogs. Inheritance is autosomal recessive, which means that puppies are only affected if they inherit the abnormal gene from both parents, who are carriers but not affected themselves. Like other bleeding disorders found in dogs (Hemophilia A and B, Thrombocytopenia and Thrombocytopathia), the primary symptom of von Willebrand's Disease is the tendency to bleed easily. Prolonged bleeding after tail docking, ear cropping or dew claw removal (These procedures occur early in life which will alert you to the problem often within a few days after birth). Ear cropping is done later, but most breeds that require tail docking or dew claw removal might suspect something within a few days after birth. Diagnosis is often not made until the dog is much older and has established a history of unusual bleeding. A simple blood test can evaluate the dog's number of platelets and clotting factors. Another method that is used is to determine bleeding times. Bleeding times are determined by making a tiny incision in the dog’s gums and measuring the time it takes for bleeding to cease. Typically, clotting occurs within 2 to 4 minutes. Some breeds have specific DNA tests that can be proformed to provide you with certainity whether the dog is (1) affected, (2) unaffected but carries a gene that could be passed onto offspring, or (3) is clear of it. Another test that could be performed is the Elisa test, which measures the amount of the von Willebrand factor circulating in the blood at the time of the test. This test is not considered to be very reliable because the amount of the factor causing the disorders varies naturally. It could show a low reading which might not mean that the dog actually has the problem. Sadly, there is not a cure, but most mildly affected dogs lead healthy lives. The primary goal is to prevent bleeding spontaneously and limit the times that bleeding may occur (surgery). If surgery is to be performed, the vet may give a transfusion before or during surgery. If known beforehand, the veterinarian can give dogs medications and clotting factors intravenously before surgery to prevent excessive bleeding during the operation. For more severely affected dogs, periodic transfusions may be required to replace the deficient factors. The presence of the von Willebrand factor is necessary for normal blood clotting to occur. For these dogs, blood type, and the cross match must be done to find the appropriate blood donors. If your dog does have von Willebrand's Disease, there are a few precautions you can take to keep them healthy. Take special precautions when grooming especially when clipping nails or trimming with scissors. Avoid other dogs that might bite during play. Examine gums periodically and the whites of his eyes for those pinpoint bleeding specks. If something seems abnormal, please call your vet! 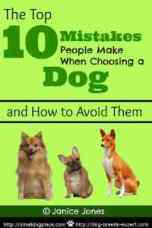 The only way to actually avoid the disease from occurring is to identify dogs that carry the mutation and remove them from a breeding program. If a dog has the problem or is a carrier, he or she should not be used. Puppy buyers can take a proactive stance on this disease by asking their potential breeder if they do DNA testing for this condition. There are DNA tests for this disease for some breeds but not all, but it is worth checking out.